This exceptional honey is harvested and produced mainly in the northern part of Bulgaria, near Tutrakan, Silistra and Ruse. 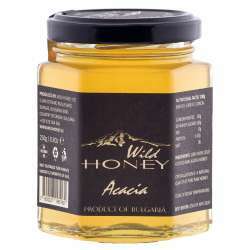 Our fine Acacia honey is collected during the springtime mainly from the nectar of “white” acacia (Robinia Pseudoacacia). Its color ranges from almost colorless to straw yellow, with very light neutral flavor and it smells sweet of acacia blossom. The taste is medium sweet and delicate, with balanced aftertaste reminding of fruit trees, acacia flowers, fresh butter, cream cakes, vanilla and apples. Rarely crystallizes.